I have done tie dye projects a few times. Usually dunking the items in buckets of dye which is only really suitable for doing one colour. 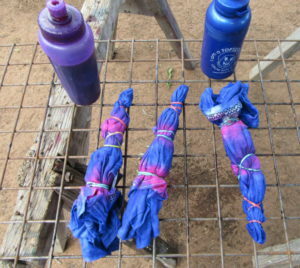 Recently we used a tie dye kit which had 2 colours with spray bottles. this was successful but a little awkward as the items had to be held and sprayed. It is hard to use a spray bottle if it is not in the upright position. This week the school asked me to tie dye some shirts for a school concert. The project was jinxed from the start but now I can tell you what NOT to do. First I bought 2 colours of dye but when I got home discovered that the dye was for hot water. I’ve used hot water dye before but it would not work with 2 colours. I then did a lot of internet searching and watched a few video’s on YouTube. 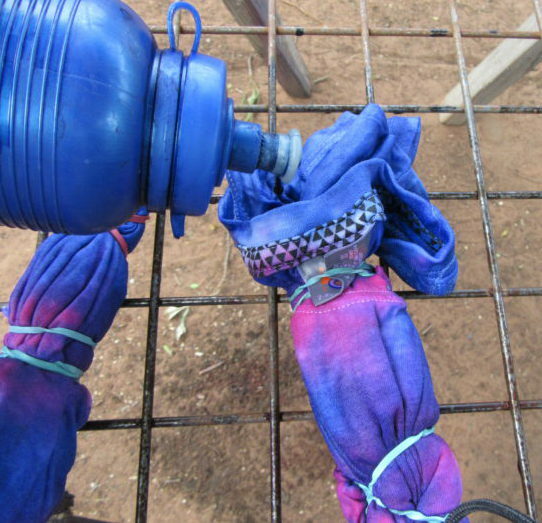 From this I discovered that I have to use cold water dye and the best method is to use squeeze bottles with a nozzle. The school gave me 4 shirts to dye, 1 was 60% cotton, 40% polyester the other 3 were 100% polyester. I also bought 2 shirts for my children to do, they were 100% cotton. Move to your work area. I placed wire grid mesh on trestle frames. You could also place a baking cooling rack over a baking tray. working in sections squirt the dye onto the fabric and try to ensure that the item is saturated with dye. Where the blue and red overlapped the colours mixed to purple. This is fun, and you can play with colours. Blue and yellow will create green where they overlap and so on. 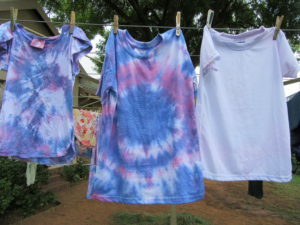 In the past, I have done tie dye as a craft project at children’s parties for the children to take home a shirt instead of a party pack. We did single colours in buckets. This method not only works better but children can be more involved in creating their patterns. Doing the school shirts was a bit of a disaster. The 60% cotton shirt worked alright but the dye did not work at all on the 100% polyester ones, they came out dirty white. I had to buy 3 replacement shirts and re-do the exercise. Fortunately I had not thrown the dye out. 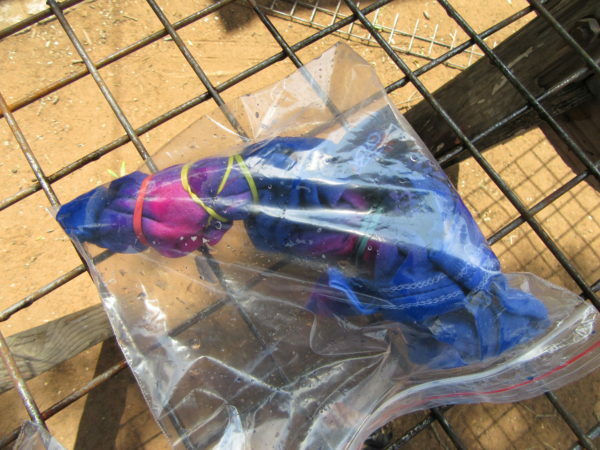 The following day I warmed the dye in the microwave and used it again. Another tip is that if you feel that there is too much white on the finished items you can re-tie and dye those sections. This was the case with the shirt which I did for Fjord and the end result was great. The great thing about mistakes and errors is that we learn from them. To dye the dress, I sort of twisted it into a ball and tied string around the outside to hold the ball in place. You have the patience of a saint 😄 I remember dyeing clothes in the 70’s as a teenager. Wasn’t for the faint hearted, but then again I have never been one for crafting or one with patience. Your tips are very helpful for someone attempting it. Interesting about the polyester. That dress came out so pretty and summery. 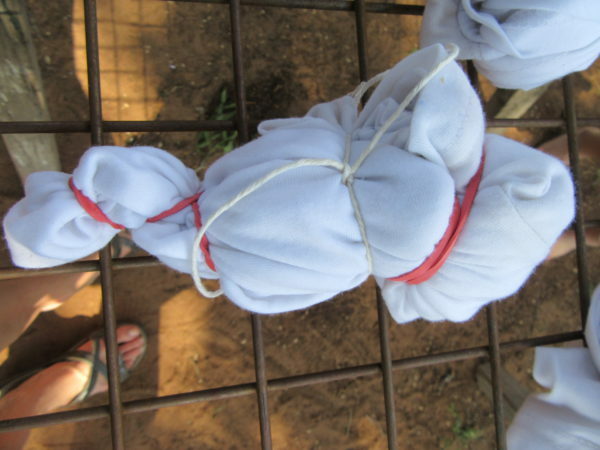 Today I tried to dye my faded black T-shirt with lady dye and the still look the same. What’s the best fabric dye?